A picnic of the students of the Dept. 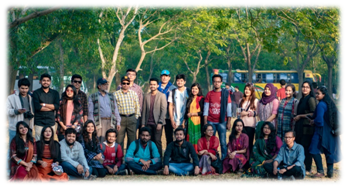 of Civil Engineering, BUET was arranged on Friday, 1st Feb. 2019. It was organized by the graduating students of Level-4, Term-2 (Civil Batch ’14). The picnic was held at the picnic spot of BangabandhuBrideg Resort in Tangail. A total of about three hundred students and about nine teachers participated in the picnic. The fun started right from the beginning of the journey at 7:00am in the morning. Seven buses carried the participants to the picnic spot from BUET. Students were excited to see the famous Bangabandhu Bridge as well as the rejected box segments remaining in the display area. Games between the teachers and students were at the center of the fun. There were pillow passing, teacher-student cricket match, batch football, musical chair etc. were among the fun events that made the day memorable for the participants. Probably the most interesting fun part was the Faculty Quiz. The students enjoyed seeing the teacher scratching their heads trying to answer the difficult quiz questions. The students enjoyed the resort full of greenery as well as the its many facilities that include the swimming pool. With countless photos and videos, the day will be remembered for long by the students. The Department of Civil Engineering, BUET, the largest department in the University, offers the very best civil engineering education in the country. It offers B. Sc. Engineering, M. Engineering, M. Sc. Engineering and Doctor of Philosophy degrees to its graduates. On an average, approximately 800 undergraduate students and 400 graduate students study civil engineering at this department. © 2019 Department of Civil Engineering, BUET. All rights reserved.